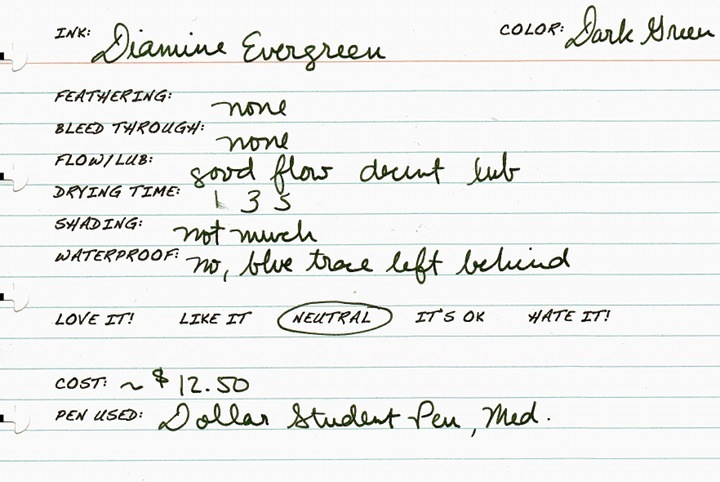 Diamine Evergreen is one of those colors that many hoped would replace the now discontinued Montblanc Racing Green. Alas, this isn’t it. While this is a nice dark green it lacks the olive tones and antique appearance of Montblanc Racing Green. Really, I’d say this is a more obviously green version of Noodler’s Zhivago. Nevertheless, if you are a fan of Racing Green, then this color will probably appeal. Honestly, I’m not much of a green ink sort of person, but even I’m kind of fond of this ink (but not fond enough of it to use it on any regular basis). Flows very freely and has decent lubrication. Not a dry writer at all. Dries pretty quickly on the papers tested. Not much shading at all. It’s a bit too saturated/dense for that. Definitely not waterproof and really not very water resistant. If you are quick you can salvage a faint trace of your writing. I am not much of a green fan either, but I do like this ink. I agree with Katie that this can easily be used in a work setting without looking out of place, but it’s got enough color to stand out. I keep coming back to it without really meaning to…I guess that’s one of the hallmarks of a nice ink!